Hey hey, we’re making sweet rolls today. Of the CHOCOLATE almond kind. That’s right, your morning cereal just got a new competitor. I’m no psychic, but, I’m pretty sure I know whose gonna win the competition. NOT. Please don’t say you thought I was serious there. What’s the deal with sweet rolls? Well, picture a cinnamon roll with all that soft, fluffy, yeasty, buttery dough, but without the cinnamon filling. 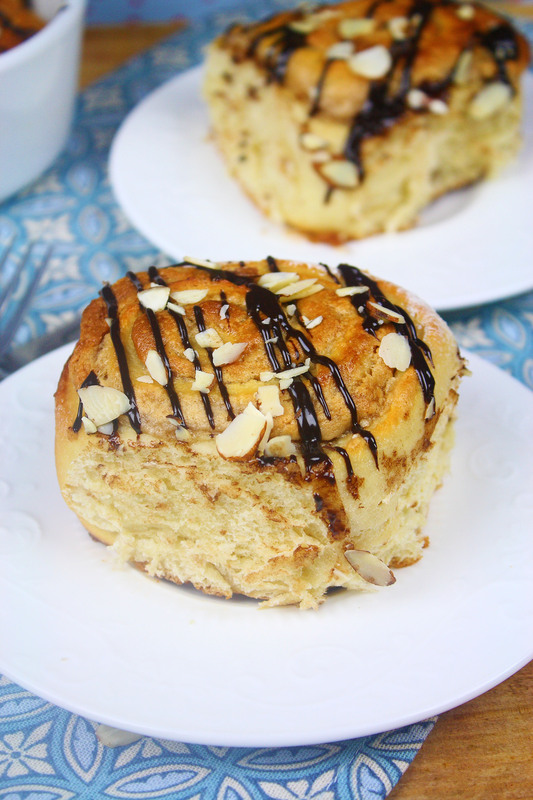 Instead it’s jam-packed with an almond filling that has just a hint of chocolate flavor. So, it’s a cinnamon roll without the cinnamon. 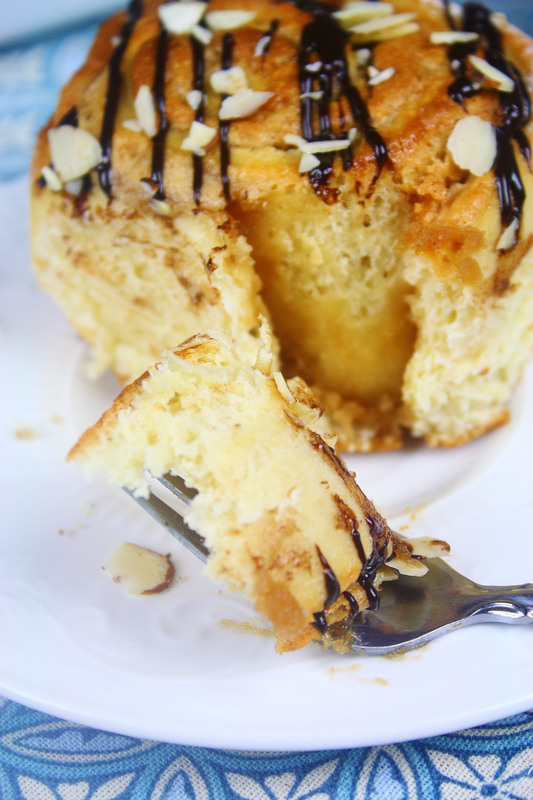 A sweet roll, if you will. I’m not gonna be picky here. Call it what you want. Cinnamon roll. Sweet roll. Get in my belly roll. Just know, it’s chocolate + almond + yeasty dough. And, you’re going to want to eat all of it. Well, if you like almond that is. These guys have a whole tube of almond paste inside them. Wait, whattt? Yup, you read that right. A whole 7 oz tube. 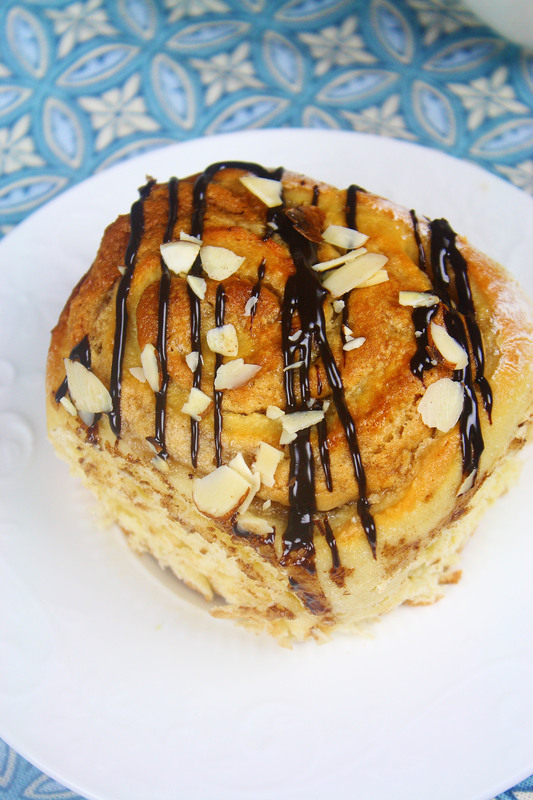 These rolls are for the almond lovers of the world. Here’s where I tell you my favorite part about these rolls. When I got up in the morning all I had to do was take the prepped rolls out of the fridge, heat the oven, and bake them. How easy does that sound? I did all of that before having a single drop of coffee.That’s an epic win. 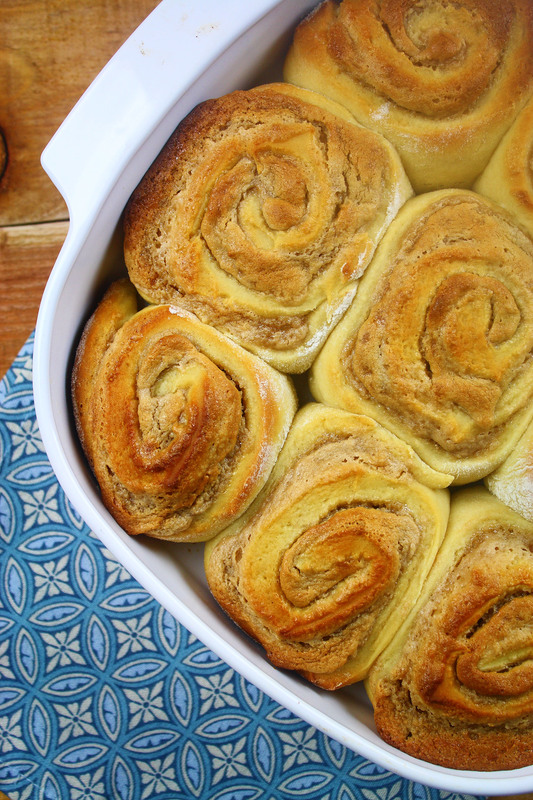 No one wants to wake up early and wait for the dough to rise before being able to face plant into a fresh sweet roll. No one. And, if you are that someone, well, you deserve some sort of award then. But, if you like your sleep and your sweet rolls too, prepare these the night before and let them sit in the fridge. Your rested brain will thank you. Your stomach will thank you. Heck, the next door neighbor will thank you for that bakery smell that’s floating in the air. They’ll also want a sweet roll. Maybe it’s best to keep the door closed then. You don’t reallly want to have to share. Right? I kind of lied to you. 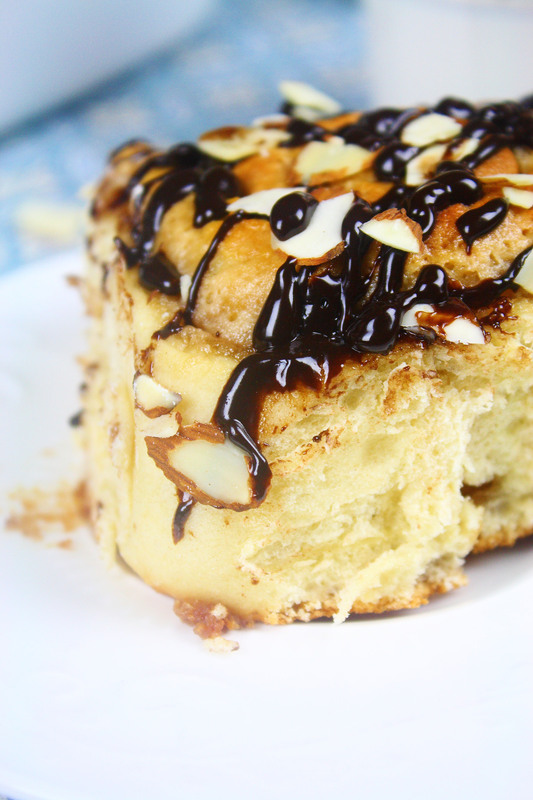 There’s one more step you have to do in the morning: the chocolate glaze. Okay, okay, hang on. It’s super easy and quick to make. Andddd, can we really count anything made with chocolate as work? But, it’s a small price to pay. A tiny miniscule price. I mean, naked sweet rolls are good too. Just look at them. All golden brown and puffed up. But, now, look at this chocolate glazed one. That’s right my wonderful friends. Making chocolate glaze will ALWAYS be worth it. Heat up milk for 35-45 in a microwave safe cup, until it’s about 120 degrees (think hot bathwater when feeling it if you don’t have a thermometer). Stir in yeast and 1/2 teaspoon sugar. Let sit for a few minutes to proof–if bubbles form on the top of the mixture that means your yeast is active! In the bowl of a stand mixer with the paddle attachment, mix 1/3 cup sugar, butter, salt, and egg until butter is evenly distributed–the mixture may be chunky. Stir in yeast/milk mixture until incorporated. Add flour and stir with the paddle attachment just until mixture sticks to the paddle. Switch the paddle out with the dough hook and continue mixing on low until dough forms into a ball in the center of the bowl. The dough should be slightly sticky and in one piece. If the dough is really wet and sticking all over your fingers, add up to 1/2 cup more flour (adding 1/4 cup at a time) until dough is easy to work with. Spray a large bowl with cooking spray and place dough ball in it, making sure to coat the top of the dough lightly with cooking spray. Cover with plastic wrap and let sit in a warm place for 1-2 hours until it doubles in size (I like to preheat the oven, turn it off, and then place the bowl inside the oven to rise). Once the dough has risen, make the filling. In a food processor, combine almond paste, cocoa powder, sugar, and egg until smooth and creamy. Set aside. On a lightly floured surface, roll out dough into a 10×14-inch rectangle. 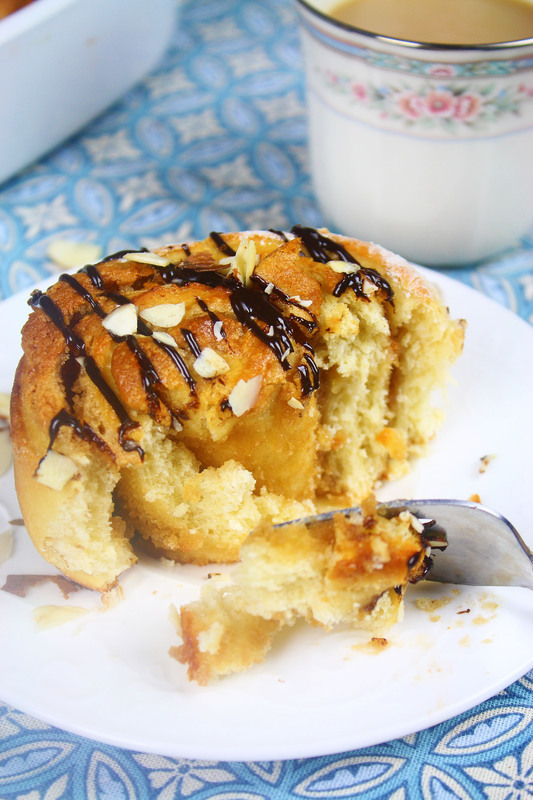 Spread almond filling on the dough and tightly roll it up. 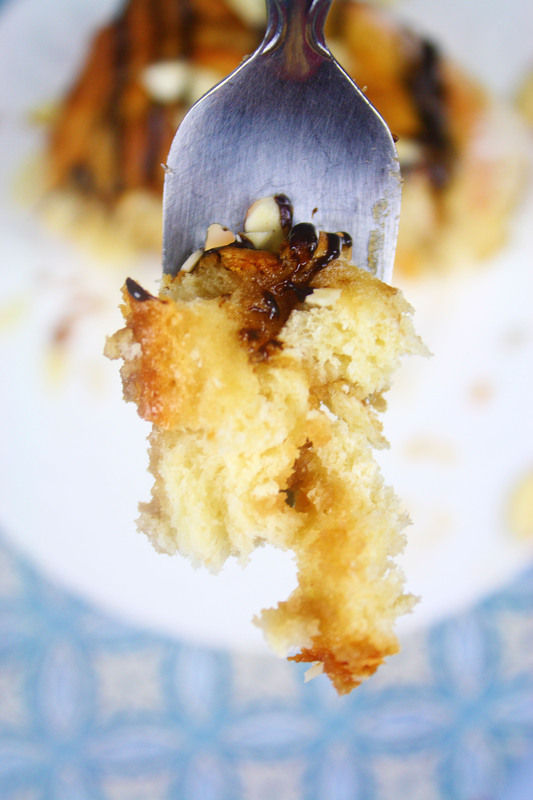 Using a serrated or sharp knife, cut the dough into 9 large sweet rolls–the almond filling will stick to the knife, so wipe it off as you go for a cleaner cut. Spray a 9-inch square pan with cooking spray and place the rolls gently in the pan. Let the dough rise for 30 minutes OR cover with plastic wrap and refrigerate overnight (in the morning let rolls come to room temperature while the oven is preheating). Bake rolls at 350 degrees for 25-30 minutes or until golden brown on the top. Let sweet rolls cool before icing. While the sweet rolls are cooling, make your glaze. Place chopped chocolate in a small bowl. Set aside. Using a small saucepan heat up heavy cream until simmering. Pour hot cream over chopped chocolate and allow to sit for about 5 minutes. Add corn syrup and whisk until well combined. 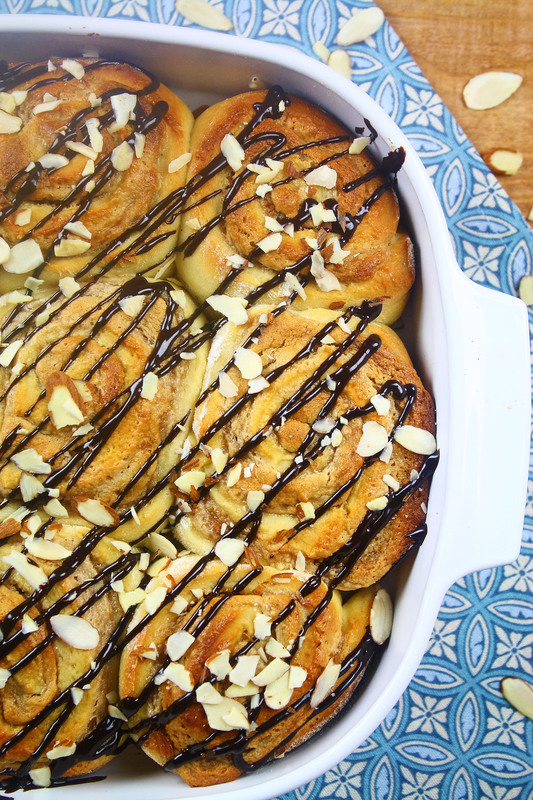 Drizzle the tops of the sweet rolls with chocolate glaze and sprinkle with slivered almonds.